So I'm slowly transferring these ideas that I get during class into drawings and then onto the site. Hence, the past two have been drawings that I've thought of in statistics class. The original idea was to have a kid with a face that looked like the exponential distribution staring glumly out his window looking at kids (each having a normal distribution shaped face) playing with each other and having a fun time with the caption "I just want to be normal." I liked the camel idea better, plus it gave me an excuse to google camel faces for a good hour or so. The other option was to have a lot of camels at a halloween party, all dressed as the normal distribution, commenting on how costume options for camels are limited. Lupe Fiasco has a new album out (Monday, but you can listen to it on youtube). I've listened to it a couple times and approve. Give it a listen if you get some time. Intramural season is starting soon which is fun because I'm looking forward to finally using the light up soccer ball that I got for Christmas. We're going to buy some glow wristbands and headbands in two different colors, and then play a game in the (relative) dark. I've never actually kicked the light up ball hard, so I don't know if it will give out the instant I put some force into a kick, but I have confidence in it. As far as the site, I'm going to see if I can get all the Jabberbox pictures up and viewable in a format similar to the drawings right now. I'm deciding whether I want to integrate them into the same list as the drawings, or have a second column for all the jabberbox pictures. We'll see how that goes. This is just to remind myself that I want to read Fever Pitch. Between all the constant distractions on the internet every so often I find something that sticks out a bit more than others. If you don't know, TED is a small nonprofit organization that hosts talks, and brings in people from areas of technology, entertainment, and design. They charge (cheapest from what I can gather on the website) $7500 to attend the ~4 day conference. Consequently, they are able to bring billionaires, mathemagicians, real magicians, and various others experts of their fields. "If you watch Jeopardy backwards, it's a show about three people paying alot of money to get bad answers on their stupid questions." Day 2: Currently sitting in a condominium in Florida, it is 7:51 in the morning, and looking out over the ocean. I'm on spring break for the week, and the family decided to go down to Florida. I tried barefoot beach running the other day, and that didn't turn out so well. I realized, post-run, (and with the help of Google), that you're supposed to change your stride (shorter strides, lift the foot rather than push off). But that's for chumps. You know what else is for chumps? Not having blisters on your feet. I now have blood blisters on my index toes. After the run, I laid out and relaxed. Day 4: Update on the Blood Blisters: They have evolved into some sort of combination of blood/normal blister (so they're healing?). I decided to just bandage them up and wear shoes when I run, and that seems to have taken away the pain. So I'm accustomed to taking various statistics, and estimating something (such as a confidence interval or the expected value). The reason that we use these statistics and estimations is because they are useful, and behave in the same way, and thus, the statistics have value in that they are reliable. We went to the dog tracks yesterday. In the program at the dog tracks, they have all sorts of information on each dog for each race- weight, wins, how it's previously placed, kennel - basically anything you would want to know about the dog. "But Jeff," you say, "Jeff, just look at all the statistics. 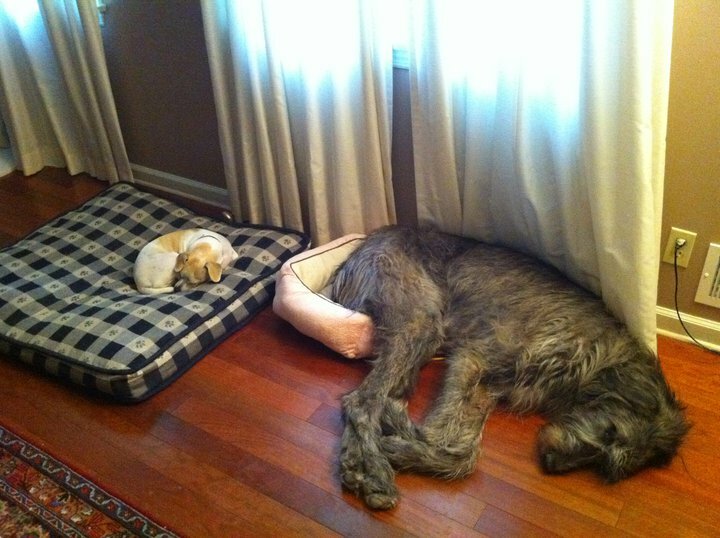 Clearly you know which dog is going to win." False. I'd rather play slot machines. With slot machines, you at least know that you have odds of losing, and you have no control over it. The program gives you some sort of false sense of possibility that you can use all of the information in it to make a decision. As far as I can tell, its all just one big crapshoot. There are so many uncontrolled variables that it's completely pointless to put any sort of meaningful thought into where you should bet your money. So, faced with my last two dollars and, having only won 1 of my previous 8 bets, I based my decision solely on the dog's name. So recently Rebecca Black, a previously completely unknown 13-year old, started trending all up in the internet because of her video "Friday." The main reason that it blew up was because it is the epitome of bad pop music, cheesy lyrics, and everything that people find wrong about pop music. However, from this, has sparked many parodies and related videos, among them one in which somebody has taken out the audio and replaced it with incorrect lyrics that fit her lip movements, and one in which iTr3vor, an intrepid Youtuber unfamiliar with the term "meek," dances to the song in an Apple store. I ran the Take Steps for Kids 5K yesterday, and that went well. It was at 5:30, and by about 11:00 in the morning, it was already snowing. By the time the race started there was reportedly 5 inches of snow on the ground. Still, I had a fun time, and it was a good way to help the chill'ins. I've started on my quest to pick up C#, and found this introduction to be the most helpful resource thus far. It explains from the ground up what C# is and how it relates to Java and the .Net Framework.